If you have a large house with 4,000 sq ft of space to cover, you’re definitely going to want to cough up some cash on a good mesh Wi-Fi system. Our favorite here at BGR is the AmpliFi HD Wifi System by Ubiquiti Labs. But if you live in a regular sized house or an apartment, you probably don’t need to spend hundreds of dollars on your wireless network. In fact, you’ll be shocked at how little you can spend and still get a really good Wi-Fi router. 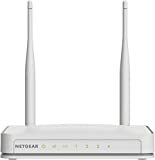 The NETGEAR WNR2020v2Wi-Fi Router with High Power 5dBi External Antennas is an upgraded version of the original WNR2020, which was already a very good router. This new model offers better range and more consistent performance, which Wi-Fi speeds up to 300 Mbps. It’s already a crazy value at $30, but Amazon is somehow selling it for just $14.99 today!